Seattle has had a “real” summer this year, so I am out of control with my salads experimentation. With this heat, I yearn for a crunchy, salty, garlicky, hearty salad almost daily. Oh, and homemade croutons speak to me as well. For at least the past three weeks, I’ve been mixing large batches of this salad dressing, then coating salad greens – mostly red baby romaine…which, ahem, I grow on my rooftop. And then comes the creativity… depending on the day it could be a few leftover veggies such as fresh roasted corn, green beans, cherry tomatoes or carrots, I usually throw in some toasted nuts and pumpkins seeds, sometimes I add a sliced hard boiled egg or some shredded chicken or fish or steak, there’s almost always a handful of fresh herbs and …voila. 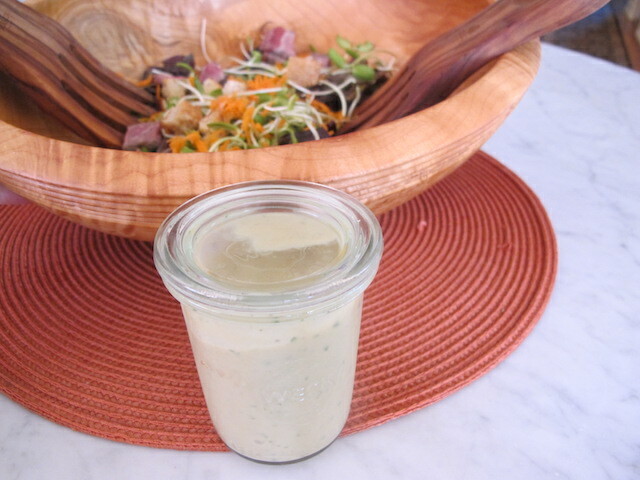 It takes about one tablespoon of this dressing to coat a pretty hefty amount of salad greens and additional items. I don’t like my salads overdressed so I add more dressing if it tastes too dry to me. But less is more. I found this previously published New York Times recipe and then adopted it to my tastebuds. As printed, I was supposed to crush the anchovy and slowly whisk in olive oil, etc etc. But Ms. Impatient here just put every ingredient into a tall straight container, then buzzed it to emulsify with my handy dandy hand blender. It comes out rather thick like dijon mustard and it keeps in the fridge for a week at least. Have everything at room temperature before you start. Then just all ingredients into a tall narrow container and use a hand blender to mix well. Store leftovers in the refrigerator. To serve: I use some type of firm lettuce such as baby romaine – sometimes I’ll add in arugula if I have it. The salad is good as a simple one with just fresh toasted croutons (dice bread into ½ inch pieces and drizzle with a little olive oil, then bake five minutes at 350). And some fresh grated imported parmesan cheese is divine too. In the picture you see, I chopped my baby romaine with some tomato, sunflower sprouts, pumpkin seeds, leftover steak, corn and croutons. YUM YUM! Then you’ll want to make more, I guarantee it. This is also a marvelous vegetable dip if any remains after you start in with your salads. Don’t forget to use it as a condiment for any sandwiches you envision as well. This entry was posted in Condiment, Salads & Dressings and tagged anchovy salad dressing. Bookmark the permalink.